If you have any symptoms like chest pain or shortness of breath, see a doctor immediately even if your score is zero. Symptoms, especially in women, may be different than what we usually expect. Things like dizziness, unexplained fatigue, profuse sweating, and insomnia are some of the other things that could indicate heart disease or a heart attack. Consider your results in the context of all of your risk factors. The 2 most consistent and most accurate risk factors for heart disease are family history and stress. There are many uncommon risk factors as well, such as gum disease and sleep apnea. Bring your results to your doctor as he/she is in the best position to understand your entire medical situation. In most cases, if you have moderate or more extensive plaque or more plaque than 70% of others your age, you should be considered for treatment with plaque stabilizing medications (statins) even if your cholesterol is average. If you have a complex cholesterol abnormality, there are lipid specialists who would be glad to consult with you. 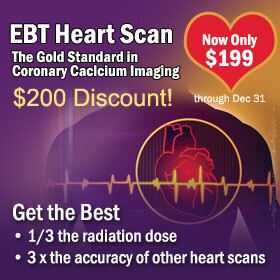 A physician referral is not required for an EBT heart scan. We will contact you directly with your results if you have a score that puts you above the 70% for your age and gender. We do encourage you to share your results with your doctor as he/she is in the best position to understand your entire medical situation. Anything above a calcium score of zero is considered a positive score. Scores range from 0 to the highest we have ever seen was 10,000. About 2/3 of Americans do have scores of 0. Scores between 1-10 are considered “Minimal” plaque burden. Scores 11-100 are considered “Mild”, 101-400 are “Moderate”, and anything over 400 is considered “Extensive” plaque burden. 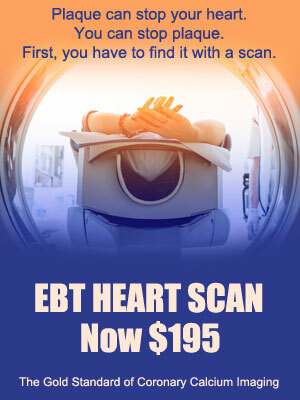 If you have severe or extensive plaque (over 400), and especially if you are under 65, you might consider a visit with a preventive-oriented cardiologist who understands our EBT heart scan. In some cases, a stress imaging procedure might be appropriate to search for hidden narrowing. If you do not have chest pain, it is likely that your stress test will be normal. A normal stress test in a patient with extensive plaque still means you are at higher risk and need medications like statins and/or ACE inhibitors. That said, not everyone with a score over 400 needs to rush off to see a cardiologist. This is why it is important to have an informed physician on board. What’s the Best Thing I Can Do for Heart Health? If you have a positive calcium score, one of the most helpful things you can do is to make sure you are taking the right kinds and right amounts of heart supportive supplements. Some of the key supplements that have been supported in the medial literature are: Omega 3 fatty acids (EPA & DHA), nicotinic acid, and vitamin D3. Very often a low-dose, water-soluble statin medication or a bile acid sequestrants prescription from your physician may also be needed. Adding more dark colored fruits and vegetables to your diet, along with a minimum of 40 minutes walking 3 times per week has also been shown in the medical literature to be effective in stabilizing plaque.